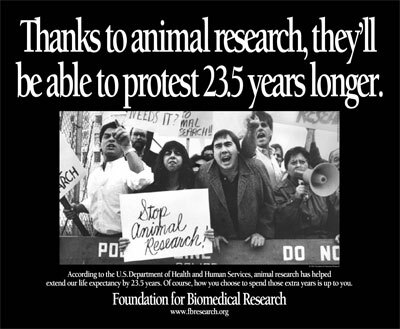 According to the US Department of Health and Human Services, animal research has helped extend our lifespans by 23.5 years. Of course, how you choose to spend those extra years is up to you. April 25, 2007 4 Comments. April 25th, 2007 at 8:17 am. Permalink. you can use your 23.5 extra years accruing heart disease from the flesh you eat, and then dying anyways. or maybe you can spend those 23.5 years living in an environment that is polluted with animal waste from factory farms, trying to come up with a way to get more water because currently half of america’s water goes to the animals that “live” on these farms. and then.. oh maybe.. you could come up with some other way to test things on “lower” life forms than yourself in this primitive world with no technology in existence. hm. August 27th, 2008 at 4:42 pm. Permalink. Why should we live an extra 23.5 years? Why on earth do we deserve that? You posting this picture suggests that you believe human life is more important than all others. The only reason you have the ability to think such a thought is the chance evolutionary shift that took our species down the path towards our current level of comprehension – in other words, the moment in evolutionary time where we became destined to turn into selfish and egocentric assholes. If you understood that, you’d understand just how ridiculous it is to believe that we are the “best” species. April 15th, 2014 at 6:43 pm. Permalink. December 18th, 2015 at 9:21 pm. Permalink.